This Japanese-inspired dish uses fresh ingredients cooked quickly to make the most of their taste and texture. Try adding some enoki mushrooms too. Place the meat in a bowl with the teriyaki sauce and half of the oil. Set aside for 5 minutes. Meanwhile, warm a large wok or frying pan over a medium heat. Add the sesame seeds and cook for about 2-3 minutes, stirring occasionally, until golden. Remove and set aside. Return the pan to the heat and increase the temperature to high. Add the steaks and sear on each side for about 2 minutes or until browned, caramelised, and the teriyaki sauce has almost all evaporated. Remove the steaks and keep warm. Return the pan to the heat again. Add the remaining oil, followed by the garlic and chilli. Cook for about 30 seconds before adding the shiitake. Stir-fry for about 1 minute then dd the shredded greens and two tablespoons of cold water. Stir-fry for a further 3-5 minutes or until wilted but still vibrantly coloured. 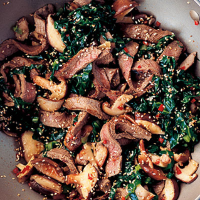 Slice the rare steak into strips and quickly toss through the stir-fry with the reserved sesame seeds before serving with rice noodles.